Ever run into a situation where you needed to quickly find out what devices were connected to your wireless network? I recently had a neighborhood get-together and a lot of the kids asked to connect their phones to my WiFi network. Unfortunately, I didn’t enable the guest network in time and so I had to give them the credentials to my main network. Sometime later I realized one or two of the kids would be standing near my house playing on their phones. At first, I didn’t think anything of it, but then it dawned on me that they were probably using my WiFi to do some Internet browsing they probably couldn’t do at home. In this article, I’ll show you the different ways you can view the devices connected to your network. Also, you should probably invest some time in learning how to setup a guest wireless network, if you don’t already have one. The best way, but not necessarily the easiest, is to check your wireless router. It’s the device that probably gives out all the IP addresses on your network, so it will have the definitive list of devices connected, either wired or wireless. First, you’ll have to determine the IP address of your wireless router. Most routers have a default IP address of 192.168.0.1 or 192.168.1.1. Once you have that info, log into the router and start browsing through the various tabs. If you don’t remember your router username and password, it’s probably a good time to reset the router, log into the router using default credentials and setup it up again. Depending on your router, the information about connected devices could be listed under many different headings. 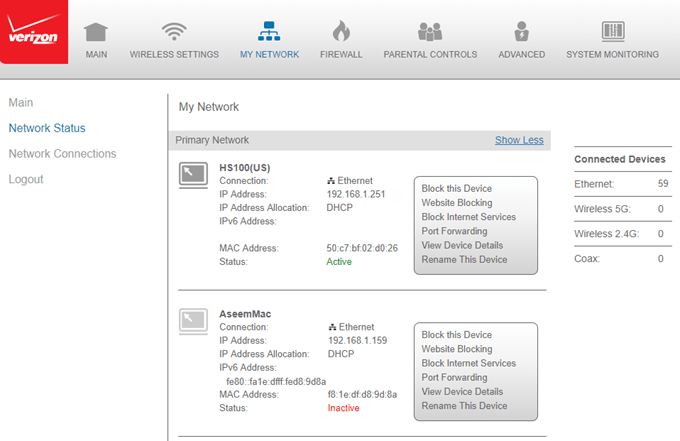 For example, on my Verizon router, there is a section called My Network that shows all connected devices. 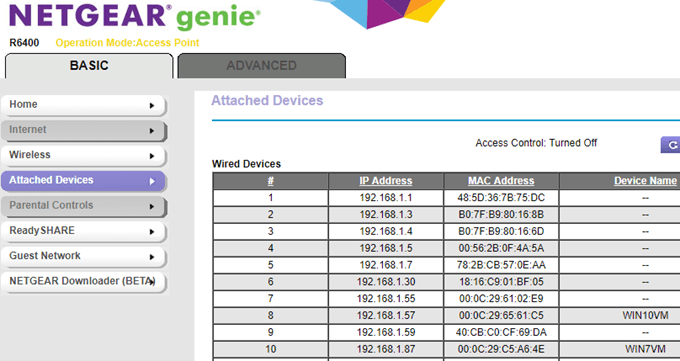 On my Netgear router, the listing is under a menu option called Attached Devices. For Linksys, you have to click on a button called DHCP Clients table. For xfinity routers, it’s under the Connected Devices section. For D-Link routers, you go to Wireless and then click on Status. For TP-Link routers, you click on DHCP and then DHCP Clients List. Obviously, there are too many to mention here, but the list is somewhere in that interface. Just keep clicking around till you find it. Depending on your router, the amount of information you get will vary wildly. Mostly, you need the IP address and host name. Having a bunch of IP addresses and MAC addresses really isn’t all that helpful. If you don’t see host names, try using a network scanner, which I talk about next. The next option is to scan your network and hopefully get some info that way. I already wrote a post on how to scan your network, so make sure to read that first. In that article, I wrote about SoftPerfect network scanner, which is pretty good. 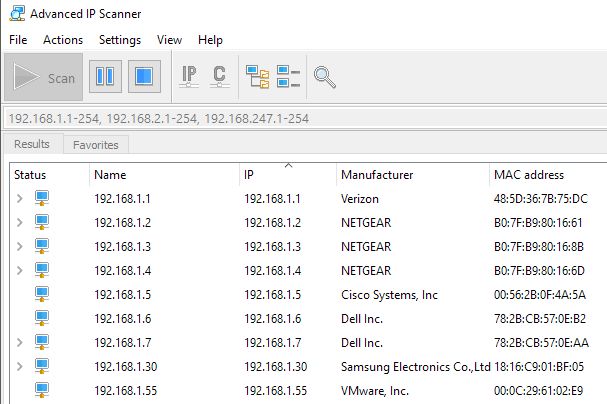 Another really good one that I use more often now is Advanced IP Scanner. It’s free, easy to use and doesn’t even have to be installed if you don’t want. It also gives you a lot of detailed information about each device, which makes it much easier to figure out whether the device is a valid one or not. Once you install the program, just open it and click the Scan button. By default, it should automatically determine your network range, but if not, you can manually type it in. It’ll take a few minutes to scan and you’ll see the output as shown above. Any device that has a web interface will have a little arrow that you can click on at the far left under the Status column. This means you can go to the web browser and type in the IP address. It’ll also automatically show you any network shares on the local LAN. This is a great way to make sure you aren’t accidentality sharing that should be private. The first time I ran this, I didn’t realize a couple of my Windows 10 PCs were automatically sharing the Documents, Music and several other folders. You can also rename the devices, save the list and use it as a baseline for future scans. If you see new devices that you haven’t named, you can check to make sure they are valid. Those are two simple ways to check what devices are connected to your router. The harder part is going through each one, finding the device, and making sure it’s supposed to be connected. If you have any questions, post a comment. Enjoy!